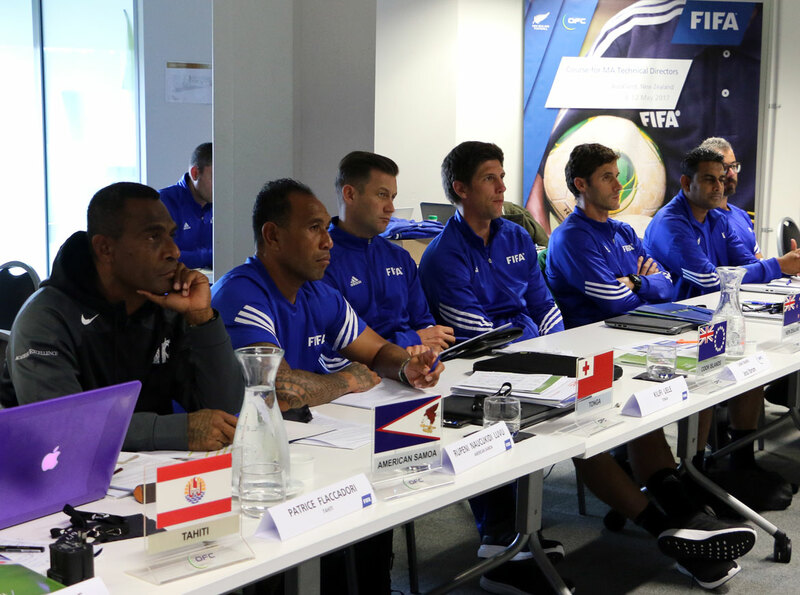 The FIFA MA Technical Directors Course wraps today, Friday 12 May. After a week of collaboration, presentations and practical sessions the FIFA MA Technical Directors Course comes to a close today, sending the enlightened leaders back to their respective countries to apply their new knowledge. Leading the week-long course alongside FIFA Head of Technical Development Services Jürg Nepfer, FIFA Technical Consultant Hans-Ruedi Hasler, and OFC was FIFA Technical Consultant Francesco Bruscoli’s who said the main focus was to upskill the technical directors in management and organisation. Guiding the football-focused participants through the content and concepts was expected to be a challenge, but Bruscoli has been blown away by the enthusiasm and dedication of the participants. “From my perspective it has been the most successful course we’ve had in Oceania in terms of participation, individual contribution and adapting learning patterns,” Bruscoli said. Meeting many of the technical directors for the first time, Bruscoli was also impressed by the impact each director has made in their respective member associations, and the milestones in development they have achieved with limited resources. “I think somehow Oceania is always considered a bit far away from mainstream football and it’s a shame because there is a lot of passion in the region and from what I saw, the federations work very well,” he said. “What impressed me is that everybody is doing programmes at the scale of their countries. Their programmes are well-chosen in terms of objectives and cost and they are very realistic in terms of approaches that are the most suitable to their situations. OFC Technical Director Patrick Jacquemet was also impressed with the progress made over the week, and is feeling very confident about the future development of football in the region. “This week has been very positive,” Jacquemet said. “The technical directors have proven that they have a good understanding of how to develop football and what their specific priorities are. We can see great focus on coach education, club improvement and competitions. Jacquemet was also proud of the technical directors’ teamwork when problem solving and adapting concepts, illustrating the collaborative culture within the Confederation. “It’s exciting to confirm that even though we, FIFA, OFC and the MAs, have different backgrounds, we share common values and the same love and passion for the game,” he said. “In order to grow the game we need to develop better people, and this course has reinforced our focus to continue working together as a team.